Kenzie is at the age now where she wants to take along toys in the car - all the time! This means parts of toys in the car, left at grandma's, lost, etc. 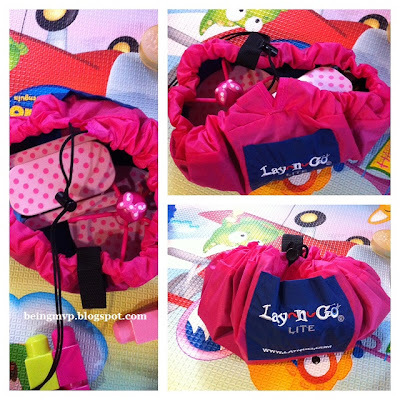 A great way for her to keep her toys together and minimize lost parts is the LayNGo Lite Activity Mat from Pish Posh Baby. This is a great little activity mat that opens to allow for play then cinches shut for travel and storage. Kenzie received the pink color mat. The 18 inch 100% nylon mat provides a sizable surface for play at restaurants, car/airplane and at the inlaws. I love this for taking along to restaurants because Kenzie usually lays her toys on the table (which probably has germs not visible to the eye) and I have to hurry and wipe it down with a baby wipe. The LayNGo Lite gives me peace of mind for clean play because it has an easily wipeable, water repellant surface. The cord lock close is a bit difficult for Kenzie to do by herself right now but with my help she pulls the cord closed. The long cord can be stored in the front pocket when traveling. Kenzie has started to show interest in blocks - she currently has large size blocks - so once she gets some small Legos, this activity mat will be perfect. The LayNGo activity mat also comes in a large size (5 foot diameter) which is perfect for containing toy overload at home. I am always picking up after her and it just drains me after a long day at work. I think Kenzie would love the green color and clean up time will be more fun with this mat. Pish Posh Baby carries everything you need for baby to toddler. The site is easy to use and live help is also available. Buy It: You can purchase the LayNGo Lite for $24.99. Make sure to connect with Pish Posh Baby on Facebook, Twitter and Pinterest! Holy cow- I want this thing! It would make my life so much easier at restaurants, on playdates, at the park.... basically anywhere. Thanks for telling us where to buy it! That is just so neat! It would be excellent for all three of my daughters for their children. Thanks for sharing. I've seen a lot of similar products lately but I think this is the first that is waterproof & wipeable--definitely a good feature to have! Thanks for sharing. OMG i want this! its waterproof and wipeable and you can tgake along with you! how awesome! i love that you can put it on the floor as an area for the child to play and its not expensive! That looks so nice and I love the large size! That would be perfect to take to a friend's house or family member's house to give a nice area for baby to play safely! Love this so much! Very cute and colorful. Would be excellent to take along with you and little ones. Thanks for the information. Very neat idea! Love how the larger one allows for easier toy pick up and storage! And the travel sized one is such a blessing for when out in public places when you don't know what's been sitting on that area before you. This sounds like a great way to organize toys, very cute.